I originally showed this bridge in 2009 but when I returned to Folsom I got some better photos along the south bank of the American River. Note in the photo below there is a new abutment supporting the portal, an amusing sign warning people to drive slowly (maybe meant for cyclists? ), another sign advertising the San Francisco Bridge Company, and some decorations on the top of the portal (probably meant to keep birds from perching on the bridge). Speaking of birds, there appears to be a big red bird (maybe a vulture) captured in the photo below flying above the bridge. You may recall the interesting story of this bridge. It was built on this spot in 1893, but it became functionally obsolete as cars became more popular, and it was closed after the construction of the Rainbow Bridge in 1917. In 1931 it was sold to Caltrans for $250 to serve as a bridge over the Klamath River on the California-Oregon border. When this bridge was replaced in the 1990s, Folsom decided to bring it back. The cost to carry it back, build new foundations and abutments, and replace about 60% of the truss members due to corrosion was about $2 million. The bridge appears to have a variety of names. 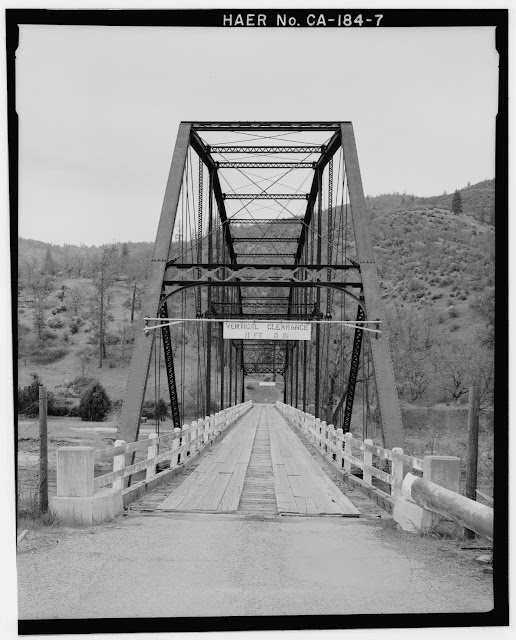 It replaced the Ecklon Bridge in 1893 and it became the Walker Bridge once it was moved to Siskiyou County. It's sometimes referred to as the 'Folsom Historic Truss Bridge' or the 'Jebediah Smith Memorial Bridge.' Also I couldn't find where the bridge length was published. In Google Earth I measured the bridge to be about 340 ft long, which is a remarkable length for a single span truss. It's another Pennsylvania Petit truss bridge, which seems to have been a quite popular bridge type in Northern California. There's a lot of good information on this bridge on the Internet. The Bridgehunter has some good information and the Library of Congress has many photos of this bridge when it was over the Klamath River (see below). Sacramento County, California Bridges: Folsom Footbridge across the American River by Mark Yashinsky is licensed under a Creative Commons Attribution-NonCommercial-ShareAlike 3.0 United States License. Can you comment on the steelwork forming the footpath railings in DSC02223.JPG? There are rules about the type of railing you have to provide on footbridges (and bridges with sidewalks). Perhaps this isn't the most attractive choice? Sorry if I didn't make myself very clear. I meant the railings and supports to the ordinary terrestrial footpath in the foreground of your pic (on which the photographer is standing) and not those on the bridge itself. They look like tie chord members and hangers, perhaps reused after the 1990s refurbishment. Yeah, I noticed them too. Funny, I don't see any on the bridge. Maybe they had some old members in a maintenance yard? They look in too good a shape to have been the members that were replaced due to corrosion.